There are a host of bands operating under the often ambiguous term ‘Americana’ that firmly plant their roots in the country rock movement that spread across the continent in the 1970’s. Forty years on, their music is a little bit too experimental to be absorbed into mainstream rock and pop but they manage to carve out their own niche within the realms of specialist radio and a buoyant live circuit. 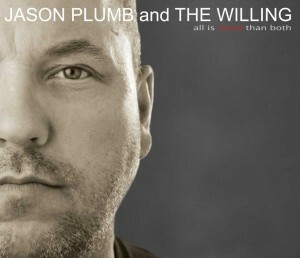 Jason Plumb is one such artist that possesses these traits and evidence is in ample supply within the content of ALL IS MORE THAN BOTH, the fifth album he has released since branching out from Canadian band, The Waltons, a number of years back. With the aid of his four-piece backing band, The Willing, the record is full of a wealth of tracks containing well constructed melodies and, although a little on the safe and conservative side, can reward listeners prepared to allow it several listens. Jason Plumb has had a long association with Ed Robertson, the front man of fellow Canadian rockers The Bare Naked Ladies who have had success in taking this type of music into the mainstream and on this record the pair collaborated to co-write the second track ‘Losin’’ which is made more memorable with a hint of banjo added to the finished product. The infiltration of many sounds that have a long time affiliation with the wider world of Americana music help to give the album a feel of diversity with an influx of session musicians adding lap steel guitar, saxophone, Hammond organ, harmonica and the trusty banjo to many of the eleven tracks. Of these sounds, the lap steel that Julie Bougie supplies to the dream-infused slow beat number ‘Under a Gun’ makes it one of the record’s highlights, closely followed by the harmonica opening Plumb provides to the track ‘On a Chain’. The best of the rest are the fetching chorus on ‘Falling Star’, the lively guitar riffs of album opener ‘First Time’ and the anthem-like feel to the closing number ‘Naturally (It Ain’t Up To Me), a suitable conclusion to a collection of songs, all underpinned by a core rock sound. As intimated earlier, Plumb undertakes the majority of the writing tasks but you don’t get a feel of the depth of the lyrical content through several listens and this is not helped by the omission of a lyric sheet within the CD pack. The album also lacks a knockout track that could force itself onto any playlists and into the attention span of a casual listener. As with a wealth of acts churning out this style of music, the live presence is probably the luring appeal but it does have merit as a whole album entity and can find a niche in that wide span of sounds banded within the term ‘Americana’.